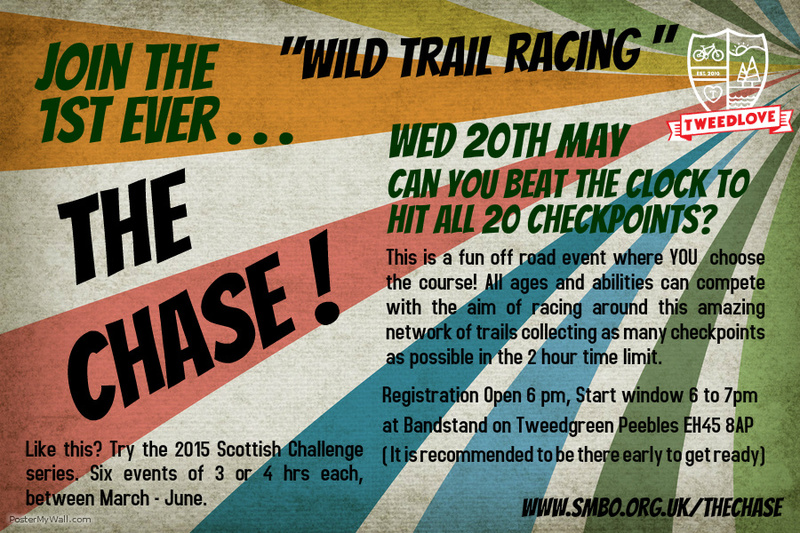 The Chase on 20th May is part of Tweedlove 2015 and organised by the same team that run the Scottish MTB Challenge Series. This is a fun off road event where YOU choose the course! All ages and abilities can compete with the aim of visiting as many high value checkpoints as possible in the 2 hour time limit. Enter as an adult and an U16 and race for just £5 as a team in our Generation Category! Great event to get the kids out. Have a laugh collecting as many checkpoints as you can before the clock catches up with you! The event will start and finish from that location. No Mass Start! – You can start anytime in a window between 6-7pm! Start Finish is at the Bandstand on Tweed Green and riders can start between 5pm and 7pm. Scores will be displayed as soon as they have been calculated and checked. Entry may be available on the day. Numbers are limited so please sign up early!